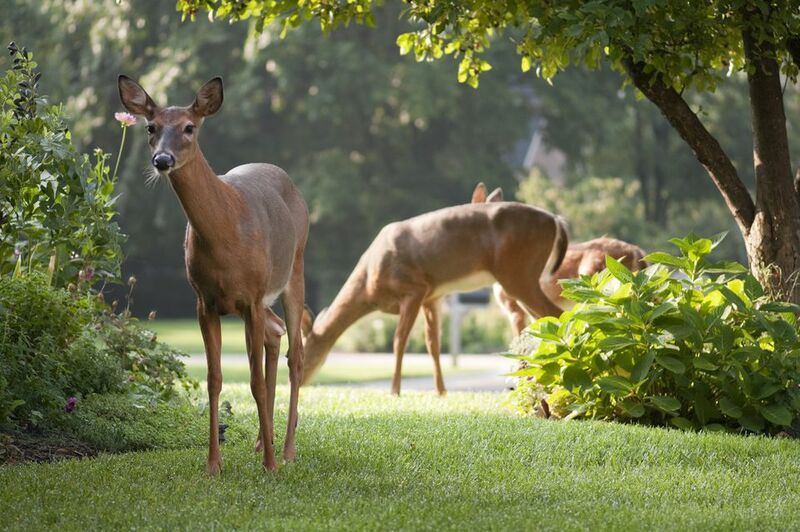 Deer-resistant ornamental grasses offer a number of advantages in addition to allowing you to sleep at night instead of worrying you'll awake next morning to find your whole yard ravaged by Bambi. They offer plant textures that contrast with most other landscape plants, many are drought-tolerant, and they offer surprising variation in color. Our intro covers a few of the deer-resistant ornamental grasses, with examples of short types, tall types, and another that is in-between. We also include two plants that look like they should be in this group (Poaceae) and are treated as if they do but, technically, aren't grasses. Hakone grass will grow in partially-shaded conditions, is not invasive, and is a deer-resistant ornamental grass. The Aureola cultivar affords an added bonus: golden leaves striped with green (often with some red, for good measure). Many gardeners enjoy giving their landscaping a spiky hairdo here and there, and Festuca glauca Elijah Blue is a great pick if you are one of them. That is exactly what a mound of it looks like: a bluish, spiky hairdo sticking up out of the earth. This is one of the short entries for this introduction. And with a name like "blue fescue," you know the color (really a bluish-gray, which is what glauca means in Latin) is a major selling point. Some growers like to grow it next to plants that display a silvery foliage. Miscanthus sinensis Gracillimus towers over blue fescue. An example of a tall deer-resistant ornamental grass, maiden grass is one of the most graceful plants you can grow in the landscape, literally: the name of this cultivar means "very graceful." 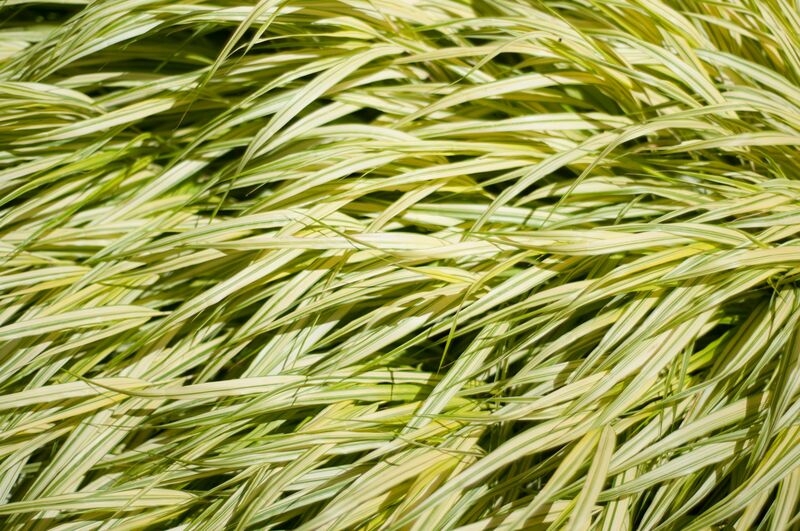 At its most colorful in fall, we nonetheless appreciate maiden grass even more in winter. During that Scrooge of the seasons, its puffy, silvery-white plumes and straw-colored blades stand out against a barren landscape to provide visual interest. As you can see from its botanical name, Miscanthus sinensis Zebrinus, this plant is a relative of maiden grass. But it is the common name that will most clearly tell the average shopper at a garden center that this plant may be preferable: "zebra grass." When comparing the two, think of this one as the striped version. That is a great selling point for many of us, hungry as we are for plants with variegated leaves. Purple fountain grass (Pennisetum setaceum Rubrum) is an example of a plant that is in-between, height-wise, for this category. Like blue fescue, this deer-resistant ornamental grass is practically defined by its color (Rubrum means "red" in Latin). And like ​Miscanthus, it bears attractive seed heads. The one problem with this plant—for those who garden in cold regions— is that it hails from the tropics, so it won't survive a northern winter if left outside. Still, we consider it a plant beautiful enough to be worth growing, even if we are able to enjoy it only during the summer and fall. This entry, despite its appearance, does not even really belong in this category. Lilyturf (Liriope spicata) is actually a member of the Lily family, not Poaceae. Nonetheless, for practical purposes, this short plant is often treated in the same manner as the other deer-resistant ornamental grasses, so we will bend the rules and include it. One nice feature of lilyturf, as compared with the other examples listed here, is that its flowers, true to its heritage, look like perennial flowers (in case you are not interested in the puffy blooms produced by Festuca glauca, Miscanthus, and Pennisetum). Many plants are pushed in garden catalogs as being "black," but few of them truly are. Most bear leaves that are just a deep purple. Not black mondo grass (Ophiopogon planiscapus Nigrescens), though. This black plant lives up to the hype. Black mondo grass may be truly black, but it is not a true grass: Like lilyturf, this 6-inch-tall plant does not belong to the grass family, but it looks like a grass, acts like a grass, and is, therefore, treated as a grass by gardeners. Take advantage of that unusual black foliage by planting it next to another ground cover that will set it off thanks to a color contrast; Angelina stonecrop (Sedum rupestre Angelina) is a good choice here because it bears golden leaves that are deer-resistant. The true pampas grass (Cortaderia selloana) is a plant for southerly regions (zones 8 to 10), where it can be invasive. It is not only deer-resistant but also salt-tolerant. It achieves a height of 12 feet. For Northern gardeners, there are deer-resistant alternatives if you want a plant with plumes, but some are invasive. An example is the giant reed (Arundo donax), hardy to zone 6 and growing 20 feet tall under ideal conditions. The common reed (Phragmites australis) is even hardier, with a range that covers much of Canada. It grows up to 16 feet tall. If you're already stuck with common reed on your land, you can take some solace in this fact: It spreads so much that deer wouldn't be able to make much of a dent in it, even if they were to nibble at it. But never grow this grass intentionally in North America, where it is one of the worst invasive plants.